The subject property is on the edge of a district in Toronto called Yorkville. The district is located directly north of Toronto's central business district and just to the east of the University of Toronto. Yorkville was originally developed as a small suburban village but with the growth of Toronto was eventually annexed. Because of its ­convenient location relative to downtown, its unique building fabric, and the greenbelt bordering the neighborhood to the north it has evolved is an upscale shopping and entertainment district. The addition of upscale hotels and expensive condominium developments have created a lot of development pressure. 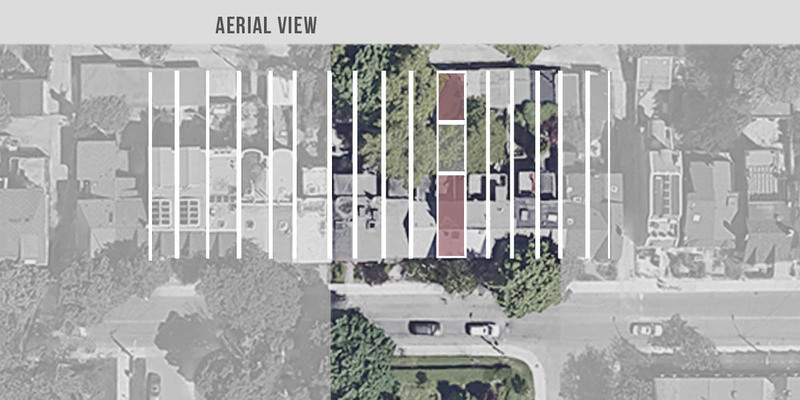 The old housing stock similar to the subject property has increased in value and current residents and planning staff are working together to establish reasonable controls to retain the character of the neighborhood while allowing for a more dense use. 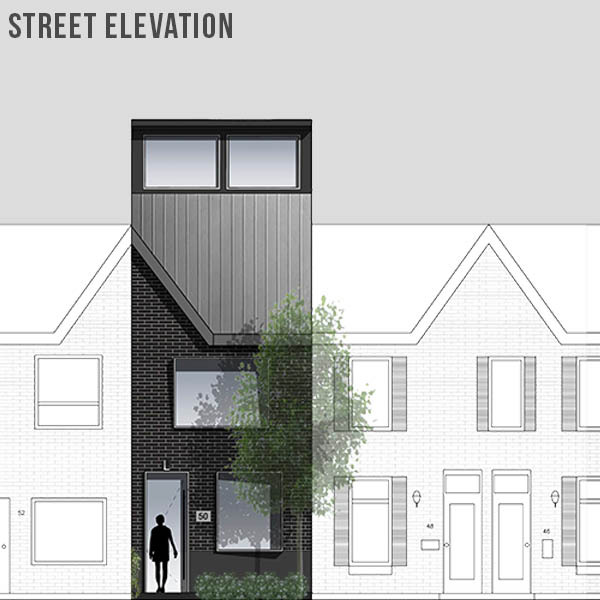 The project includes the renovation of an existing turn of the century row house. Originally built as worker housing the street is composed of mostly intact two-story brick row houses with walk-out basements that are situated on lots that measure 12.85' wide X 120' long. The walls separating each row house are shared therefore the actual wall-to-wall dimension of the interior spaces is 12'-2". 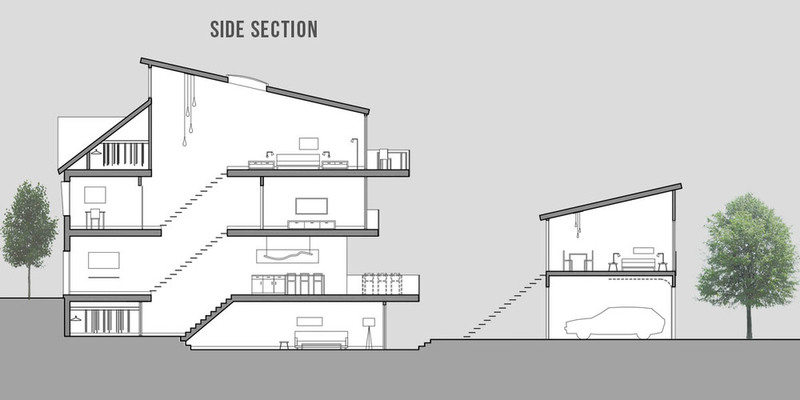 The extreme narrowness of the lot dimension severely limits the plan arrangement. The renovation includes converting the existing basement level to a family room, creating and open plan living, and eating area on the ground level, providing a home office and guest room on the second floor, and developing a master bedroom suite on the top floor. The total square feet of the project after completion will be 1,625 square feet. The bonus room over the garage adds an additional 240 SF for a total of 1,865 SF. Many great cities have a rich housing stock comprised of turn-of-the-century architectural buildings. Much of the row house stock was built to serve the working class and merchant class of late 19th century cities as industrialization and a migration from an agrarian economy was transforming both European and North American cities. The architectural heritage of these row houses varies greatly depending on location, climate, available materials, and the heritage of the builders who realized their construction. Smart regulations are needed to retain the qualities of these buildings that still endure, but they also must not be frozen in time and the regulations need to allow for a sensible and sensitive evolution of the fabric to meet current and future housing needs. The proposed project posits some solutions that we think are appropriate as a response to current needs. The proposed project retains the simple brick façade and shared gabled architectural feature but new windows are inserted into the simple brick façade. The roofline is extended and clerestory windows added to provide adequate lighting to the new master suite on the third floor. The overall building height is within the current allowable but the vertical wall to accommodate the clerestory would not be allowed. The location of the clerestory is set back from the front plane of the row house by 13’ and although visible from the street does not interfere with a clear reading of the original façade and is a reasonable accommodation to support a more intense use of a valuable resource. The rear of the buildings along the block are accessed from a service alley and some have garages with intervening rear yards, and some have extended rear yards. The rear of the units face north and overlook a landscaped beltway of parks and natural topography. The architecture of the rear is predominantly wood siding and very informal in character. There are no significant historical features at the rear of the row houses and other than setback limits and height limitations there are no architectural restrictions. Garages located at the rear of the lots are restricted to one story. 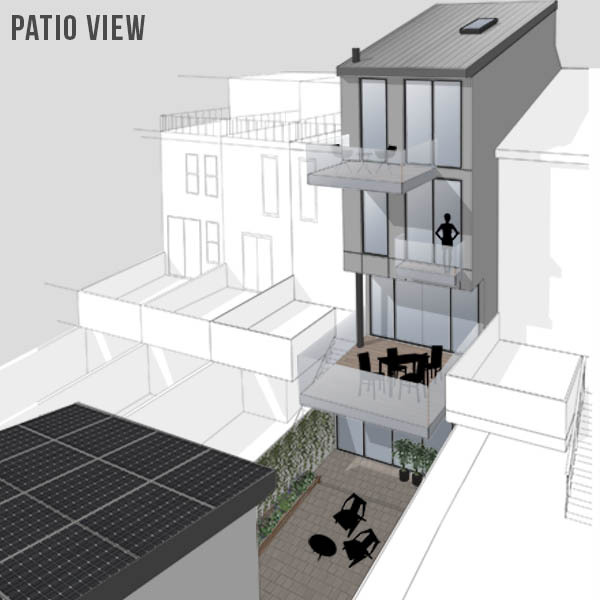 The proposed project includes a "bonus room" located over the garage of 240 SF that could be used as an accessory dwelling unit or a separately accessible home office.